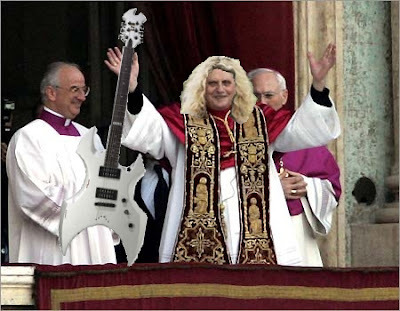 Vatican City, Italy: Just mere moments ago Pope Benedict XVI announced that he will be leaving behind his papal whites to fulfill a lifelong dream of starting an 80's hair metal band -- he'll soon be trading in his papal staff for an ax guitar and his mitre for a hair-metal wig. The word of the Pope's decision came as a shock especially after a recent labeling of Bob Dylan a "false prophet." His decision is already making waves around the world. We have received reports of millions of catholics flocking into churches in order to do penance and prayer for the Pope so that he won't go. It is being reported that thousands of teens from around the world have gathered in St. Peter's crying and chanting "Say it ain't so! Please don't go!" Desperate attempts are being made by those across the western countries. Men and women a like have flocked to bars and have been ordering German beers all day. One patron commented, "Maybe if we drink enough beer here in America and show the Pope that we love beer too. Maybe then he will stay." As those people who remain faithful to the pope and the papacy seem devastated, the other end of the spectrum seems to be rejoicing. For in addition to the reports of the mourners of the late pope, we have been receiving unconfirmed rumors of Barney Blessing popping up all over the world, cookie masses, and broadway style eucharistic prayers. Speculations are swirling as all Cardinals have been called back to Rome not to elect a new pope but to talk Benedict XVI out of leaving the papacy. It is being suggested that the Pope will be calling his band, if in the end he does leave the papacy, "The Papal Preachers" where he will go by the front line name "Papa Ratzzi." 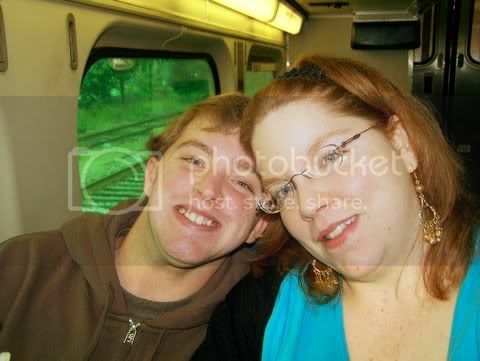 oh my eyes, my eyes!